The aircraft, previously referred to as the Bader (the Arabic name of a species of Falcon) will also be formally named, probably by a senior member of the royal party, though what that name will be remains unknown. Calidus is the genus name of a type of Peregrine Falcon, so something Falcon related may be chosen. The B-250 has been designed from the ground up to address modern requirements in terms of capability and operating costs. In fact, there are two prototype B-250s at Dubai, one on display in the static aircraft park, next to Calidus’ demonstration tent and simulators, and one appearing in the daily flying display. Kovács had previously led the design of the Embraer T-27 Tucano and was involved in redesigning the Golden Aviation A-67 Dragon light attack aircraft (originally designed by David Goldsmith of the Ohio-based specialist warbird restoration company) into a tandem-seat aircraft, which afterwards bore a striking resemblance to the Tucano. Whereas the Dragon used all metal torque-tube construction, the B-250 comprises carbon fibre composites, borrowing technology from the T-Xc Sovi. 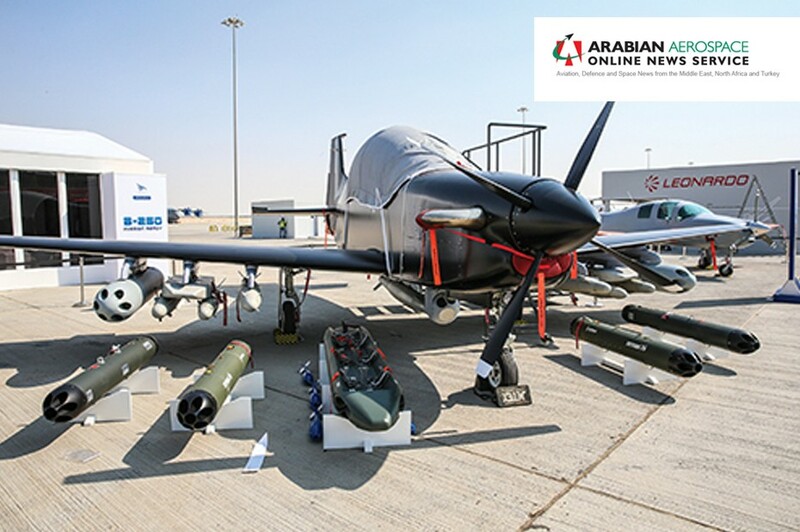 The B-250 will be built in the UAE and Calidus has already started development of a production complex in Al Ain, which the company claims will be a regional hub for aerospace industry excellence. The aircraft is designed for close air support (CAS), intelligence, surveillance and reconnaissance (ISR) and training missions, and is optimised for asymmetric warfare. With its fleet of Iomax Archangel light attack aircraft, the UAE Air Force and Air Defence does not seem to have an obvious requirement for the B-250, though export prospects could be good in the MENA region. Of similar configuration to the Super Tucano, the B-250 features large ‘wet’ wings with eight hard points for weapons carriage. The aircraft is larger than the A-29 Super Tucano and is claimed to have superior performance. The B-250 is also claimed to have the most comfortable and advanced cockpit in its category, with Rockwell Collins avionics. The first prototype reportedly made initial engine runs at the end of June 2016 at Novaer’s facilities at São José dos Campos, but the subsequent flight-test programme has been kept under wraps.